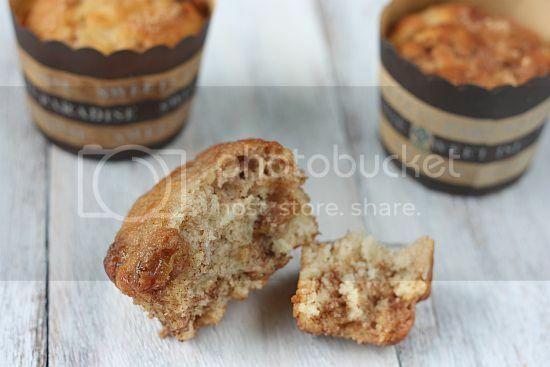 I love eating cinnamon raisin bread so having a baked a version of this in a muffin seems oh so right! The recipe seemed simple enough except it needed two additional ingredients which I do not usually stock up in my larder. This being yogurt and applesauce. Yogurt was simple enough to find but for applesauce I had to buy this from a larger supermarket. The regular local neighbourhood grocery or supermarket would certainly not stock this as most shoppers don't buy it for their regular use. Over three weekends ago, I tried out the recipe and oh was it so, so good! The smell of cinnamon whiffed through my kitchen and I could not wait for the muffins to be baked. Once they were out of the oven and laid to rest for 10 minutes, I was eagerly picking up, peeling off the cake wrapper and breaking it apart. Since then, I have made these muffins on two other occasssions. These are great pick-me up morning breakfast snacks on the go and even after refrigerating them for two days (ok I made more than my normal share) and then warming them up slightly, they tasted just as good. This is definitely another "keepers" recipe that's for sure! 1) Preheat oven to 180C or 350F degrees. Line a muffin pan with paper liners and set aside. Mix together 1/2 cup brown sugar, cinnamon, nutmeg and raisins in a small bowl and set aside. 2) Place granulated sugar and butter in a large mixing bowl. Beat with an electric mixer until well blended, about 2 minutes. Add eggs, yogurt, applesauce, and vanilla to bowl. Mix until well combined, about 2 more minutes. Slowly add flour to bowl, mixing well as you go. Add baking soda, baking powder, and salt to batter and continue mixing until combined. 3) Set the batter aside. 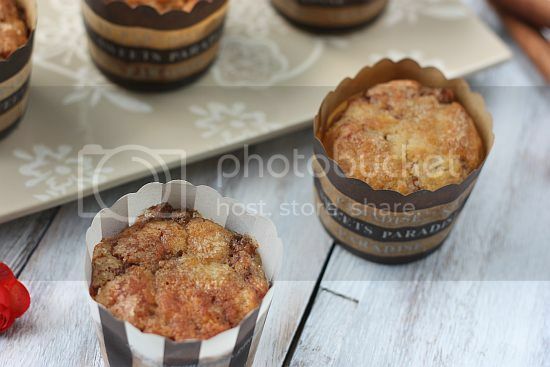 Pour brown sugar raisin mixture on top of batter and lightly fold into batter using a spatula or wooden spoon. You should only fold this 3 or 4 times - you don't want to incorporate it into the batter too much. 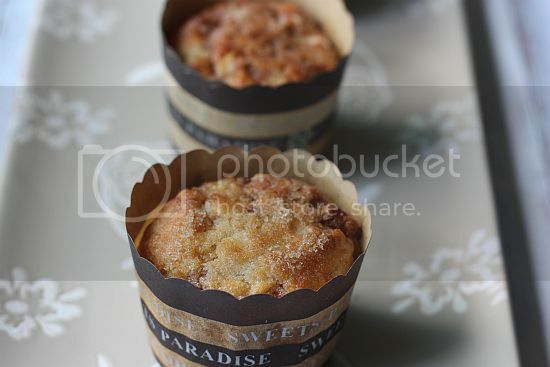 4) Spoon batter into muffin cups, filling each one about 2/3 full. Sprinkle each muffin evenly with the remaining 1/4 cup of brown sugar. 5) Bake for 15-18 minutes, checking for doneness after 15 minutes. Muffins are done when a toothpick inserted into the center comes out clean. Let cool in pan for 2-3 minutes before transferring to a wire rack to finish cooling. Cinnamon and raisins re also my favourite components. 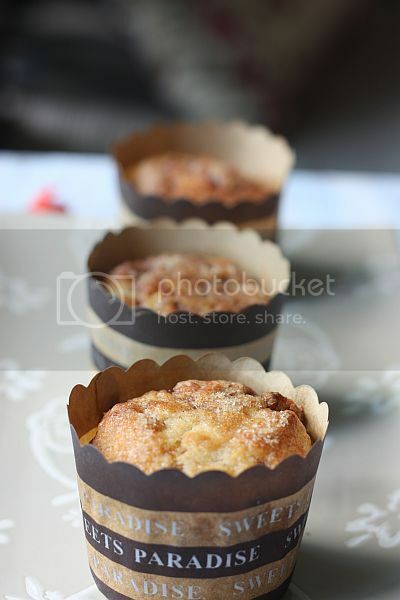 Love those muffin liners! Jo, nice photos! The sound of cinnamon-raisin muffins is so good (worse off, it's time for breakfast for me now!). Those look so yummy! I'm not a huge fan of raisins though so I would leave them out. I hope doing so wouldn't change their taste at all. The best combination ever! Love your shots. These look lovely. I imagine that the applesauce adds a wonderful flavor as well as making them super moist. These look delicious. I want one! 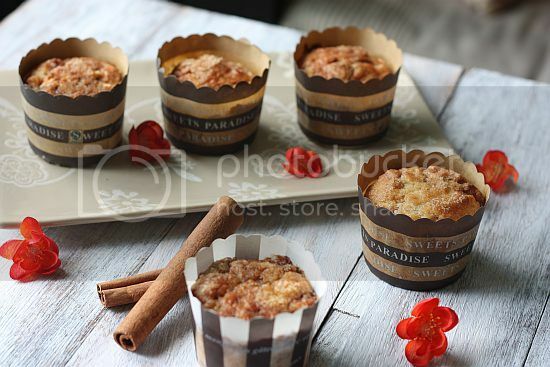 In your photos are they medium sized muffins or large ones?? Just made these muffins and they were delicious! Thank you!